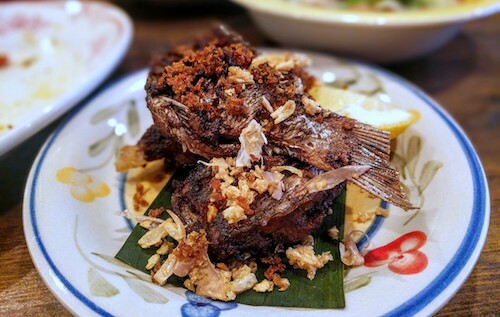 The much beloved chef formerly of Kao Soy and then Chiang Mai, two restaurants in Red Hook, Brooklyn briefly serving Northern Thai food has returned in spirit to create two new restaurants. Unfortunately for us, one of them is going to be in North Carolina, where Chef Supachana now lives. She has left the reigns of her Brooklyn empire to her partner chef, who has opened Ugly Baby in Carroll Gardens. After a first visit, the spirit seems to be alive and well. In the deep south of Carroll Gardens, just below the point where F and G trains come out from underground on their way to Smith/9th Streets and onwards to the BQE and Red Hook, Ugly Baby has set up in the location of a former gourmet sandwich shop. They have left the open plan as is and painted colorful murals on both walls. The kitchen is in full view, so you can stroll back to eavesdrop on your meal being prepared or more likely to kiss the shoes of the chef making your amazing meal. Despite being known for Northern Thai, now the chefs are expanding with a few dishes from central and southern Thailand. 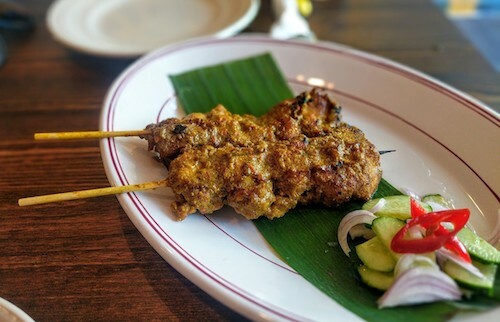 The Muslim south is wonderfully represented by gai golae ($10, below), two skewers of chicken that put normal satay to shame. This is named after the colorful curving fishing boats used by fisherman, and uses very thick and tender juicy pieces of chicken. More ingredients in the sauce make it much more flavorful and spicy than the varieties that generally just taste sweet and peanutty. The large portion of laab ped udon ($16, below) had a uniqueness we could not quite put our finger on. 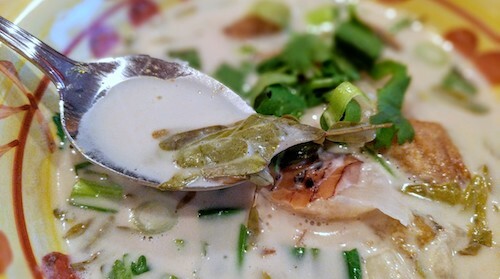 It was served with an herb that immediately gave me the memories of Laos when I ate it. Upon a bit of later research, this herb called Vietnamese coriander in English is indeed used a lot in Lao and Isaan renditions of laab. This version hails from Udon Thani, an Isaan city just over the border from Vientiane, Laos and is the creation of Chef On, who took care of our meal on a Saturday afternoon. 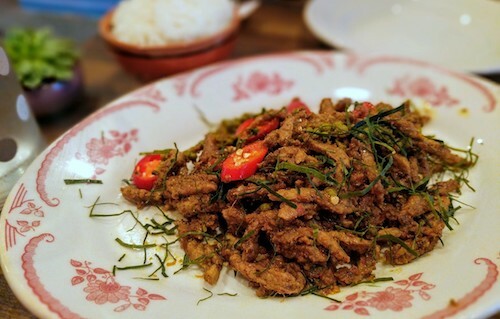 The fresh and rather large chunks of spicy duck are well complemented with kaffir leaves, mint, cucumber, cabbage, and green beans. 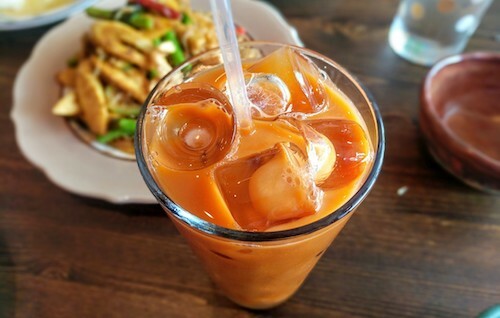 Part of its unique flavoring comes from a coating of tamarind sauce. 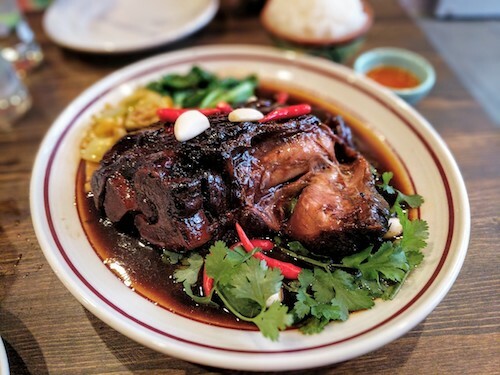 Gang hung le has made an impression here in New York City in the former Northern Thai restaurants of Red Hook and also Thai Diva in Sunnyside, Queens. This pork curry is deep in richness and color, and beloved on its own. It is also the main ingredient on occasions when too much food is brought to the temple to feed monks during important events. 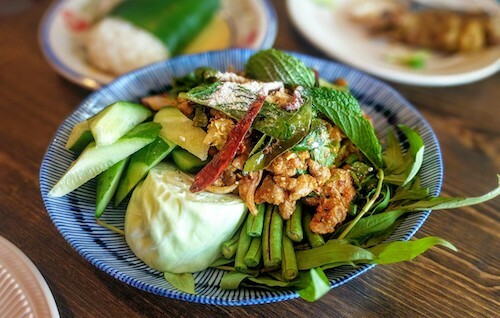 The meat will be stir-fried with glass noodles, kaffir leaves, lemongrass, chilis, and other ingredients to create a "kitchen sink" type dish out of all the leftovers. This dish, kang hoh ($16, below), is passed out amongst all the people that brought foods and came to temple for celebration. 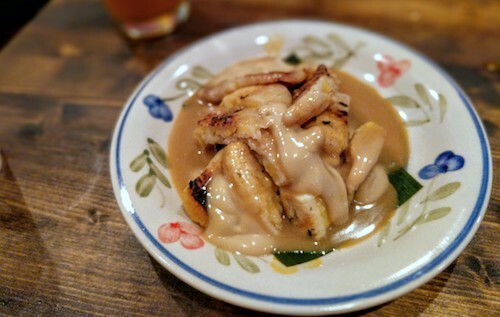 Here at Ugly Baby, the dish is a must-try for its complete uniqueness in New York City. 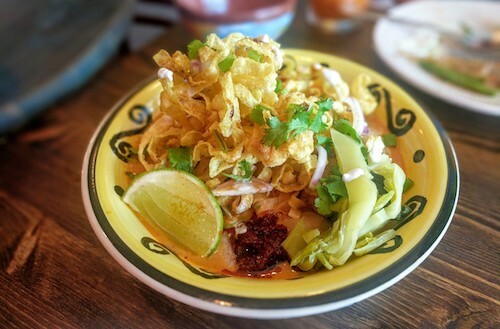 Possibly the most famous northern dish is khao soi, a curry noodle soup made with boiled and crispy fried egg noodles. 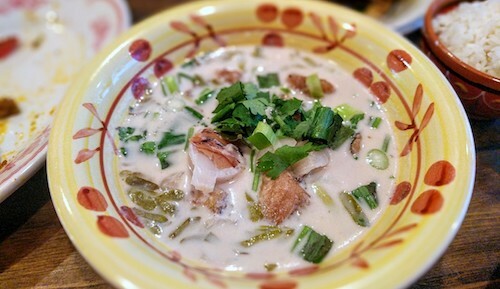 In Chiang Mai restaurants specializing in the dish, you usually have the choice between chicken and beef, but here in New York we usually see this dish only offered with chicken. Ugly Baby has decided to end this trend, offering khao soi nuer ($15, below), with beautiful tender pieces of beef shank and beef meatballs. Just the right amount of red chili is in the bowl for decent heat, but this soup should not be overwhelmed. An assortment of pickled vegetables and the squeezing of a lime add nice sour notes. The curry itself is divine, only slightly sweet and just right. 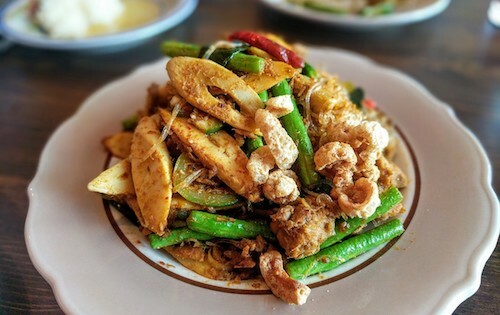 This is definitely a dish that should not be tried by the run-of-the-mill Thai restaurants all over the city because it takes a highly skilled chef. This beautiful bowl, while slightly more expensive, reminded me of the amazing versions served at Khao Soi Lam Duan, my favorite spot in Chiang Mai for the soup. Ugly Baby is officially open for business on Friday, September 1st, serving dinner only on weekdays and lunch and dinner on weekends. This meal was eaten during a "friends and family" soft opening and was unexpectedly fully comped. Not a word (besides this paragraph) would have been different had we been able to pay. As they find their feet and start running, I expect the restaurant to get even better and keep wowing patrons from all over the city as word gets out and this becomes a destination.